So today was one of those days that will go down in history as epic. Epic. Some of our students went absolutely and positively crazy. Cra hazy. There was a butter knife in one situation and a rock larger than my hand involved in the other. Everyone was safe and it sounds worse than it was, but it was crazy. But, my day ended much better. We were able to leave early instead of doing our typical Wednesday PD since it was so nice out (like 65 here). And, on my way home I discovered that my favorite little ice cream place is open for summer. YESSSSS!! That medium chocolate chip cookie dough hurricane (like a DQ Blizzard) made things a whole lot better. And probably helped me control myself enough not to drink an entire bottle of wine tonight. I’ve been in a math mood lately. This may not seem strange to you, but it’s very strange to me. I’m a reading person. I have my master’s degree in reading. Why so much math lately? The only thing I can think of is that math is much more cut and dry and black and white. I’m not really sure. You certainly benefit though! First, is a packet that’s available in my TpT and TN stores for $3. 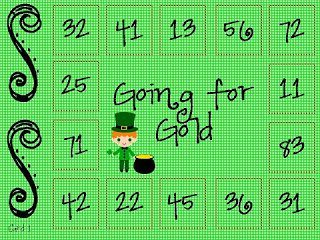 It’s called Going for Gold and it practices double digit subtraction without regrouping. It’s a set of 6 different gameboards and cards that are designed to be played in centers with partners. I also made a super simple gameboard that can also be played in centers. This one practices addition or multiplication- you choose what is best for your students! If you print out the gameboard, put it in a sheet protector, it’s an instant easy game that you only need counters and dice to play! It doesn’t get much easier than that! Players roll a dice, move that many space, and add or multiple the numbers together. The first player to make it around the gameboard 4 times is the winner. It’s 4 times because it’s a 4-leaf clover game. Get it? Of course you do 🙂 You can download the game by clicking on either picture below to head to my TpT store. Feel free to rate it after you’ve downloaded it, and don’t forget to follow my store to be the first to hear about all of my new items! Also, I posted a 120-grid number sense freebie on my Facebook for my followers. Click the images below to head over to my page, like it, and download the super cute freebie there. Have a fantastic day! I'm now following you as well. I love your blog! Thanks for stopping by. I love all of your blogs so I was happy to join in!